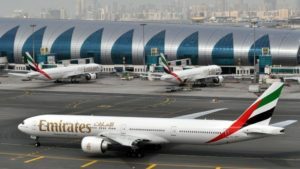 UAE’s top two airlines have mocked reports indicating that the two firms are in talks for Emirates take over its Abu-Dhabi-based rival Etihad Airways in a move to form the world’s largest airline. A Bloomberg report citing sources, claiming to be knowledgeable of the alleged talks, said the two global airlines could reach a merger deal in which the Dubai-based airline would control the main airline business of Etihad Airways. The talks, which are at a preliminary stage, would see Emirates acquire the main airline business of Abu Dhabi’s Etihad, which would keep its maintenance arm, according to the sources, who asked not to be named because the matter is confidential, Bloomberg said. “Emirates does not comment on rumors or speculation,” the official added. Reports of tie-up between the two airlines had emerged several times in the past but both firms repeatedly denied any plan of merger. Posted by Jaber Ali on Sep 21 2018. Filed under Gulf News, Headlines. You can follow any responses to this entry through the RSS 2.0. Both comments and pings are currently closed.